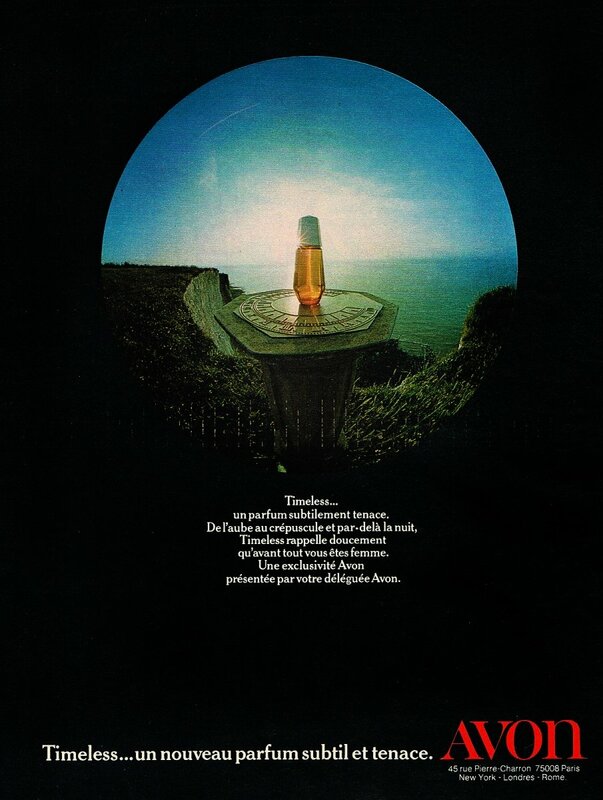 Timeless (Cologne) is a popular perfume by Avon for women and was released in 1974. The scent is oriental-powdery. It is still in production. Not the original but still pretty good. I remember the original of Timeless with great fondness. It was a powerful beast, dry, earthy, balsamic, resinous, a little floral, very musky. One spray was enough whereas with the current formula it is quite easy to get through 1ml per application, but although tame in comparison the current version is nevertheless a lovely autumnal wear. One of the main differences between the two, on my skin, is that the current version drys down with a noticeable cup cake vanilla essence note that I never noticed with the original. Timeless is an incredible scent for the few dollars it costs. There is a current version available through Avon's catalogs and vintages are available. There are discernable differences between the two that should be noted. While the vintage Timeless plays the aldehydes strongly, the newer version is a creamier mix of honeyed vanilla that hits right away. The honeyed vanilla mix takes time in the vintage to arrive, but the wait is well worth it. The vintage version lasts much, much longer, is deeper in tone and reminiscent of Shalimar. Gardenia brings greenness, iris brings a rich earthiness, while jasmine carries this scent strongly to wonderful heights. There are so many notes in this perfume that mix together wonderfully to make it a blend that is pleasantly aromatic, elegant and one that belies its' own price tag. Timeless is a perfume that could be worn anywhere-to dinner, to an event, to a gallery or with jeans. It is a perfume that wears the person, the person doesn't wear it. It is a mature fragrance, one that reminds you of notes found in many other remembered classics, like Shalimar or Emeraude or one of the Chanels. Its' rich warmth is its' own elegance. This is a fragrance that is wearable year-round and since Avon offers shower gels, body creams and deodorants at a ridiculously low price, you can pamper yourself with a complete set. Timeless wraps itself around you with a graceful quality reminiscent of older perfumes. You can wrap yourself in its luxuriousness easily just as you would an over-sized cable-knit sweater or a tuxedo jacket. It just fits quality, whatever you're wearing, whatever you're doing. 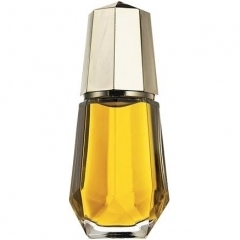 It ripens into a mature scent that fully explores its many faceted notes as the hours go by. For its price, it absolutely cannot be beat. It fools many when they attempt to guess what perfume it is that you're wearing, and there is a reason why. The tonka bean, the opoponax, the vanilla, the patchouli and the amber are all similar ingredients to a few heavyweights in the classic perfume market and Timeless incorporates them excellently. Vintage Timeless takes longer to develop on your skin, works longer to develop through its notes and stages and is more full-bodied. With today's version of Timeless, its end is its beginning. It packs a punch, yes, but you miss the soapy aldehydes in the beginning. The older bottle is amber glass, silverish-gold cap, cognac-colored liquid splash and 2 oz. The new is in a clear spray bottle with a rose hued cap, a light golden liquid and 1.7 oz. Longevity is about four hours for the new and much longer for the vintage. Both versions are wonderful. The choice to make is whether you want to explore a more vintage feel for aldehydes and a soapy feel, a journey through a perfumes character when you choose the older version or if you'd rather go for the gusto with the newest version which gives you the immediate sense of scent. There is no wait, you arrive at your final destination immediately. Either way, Timeless should be a perfume every woman should try. This was my grandmother's signature scent from the early 80's until she passed away in 2006, so this fragrance is forever linked to my memories of her. All she ever needed was a spritz of this on each wrist and a little red lipstick to be glamourous. Nostalgia aside, it's a lovely fragrance that smells "classier" than the average Avon fragrance. I agree with Digindirt: it does give the vague impression of Femme. (Sadly, I've not smelled Estée Lauder Private Collection). I like the simplicity of this. Everything seems to play an integral part in the smell, and while I can make out most of the notes, it's well-balanced. I smell the aldehydes and florals first, followed by the amber, vanilla and musk. The sillage and longevity are great with this, so you don't need much. This is a really very nice fragrance, too bad I didn't find it sooner. Thank you Jackson Spines for the free full bottle! I must say that I never considered wearing Avon before joining this forum but I have now acquired quite a few. Timeless reminds me of Femme Rochas and eerily like one of my signatures, Estée Lauder Private Collection. It's dry, a little on the green side, and some kind of powdery softness. I wonder if aldehydes or iris is the culprit. Crispy and clean, not really grassy but a green freshness. I tend to dislike fruit and citrus but a few of my favorites, Patchouli, Amber, Cedar, and Jasmine hold me down and won't let me escape. Feels like a classic scent, no bubblegum, no pralines, just femininity and class. I'm impressed Avon! ^5! Write the first Review for Timeless (Cologne)!